This week Google announced a number of new AI-powered updates for G Suite, which will hopefully eventually trickle down to us consumer users. 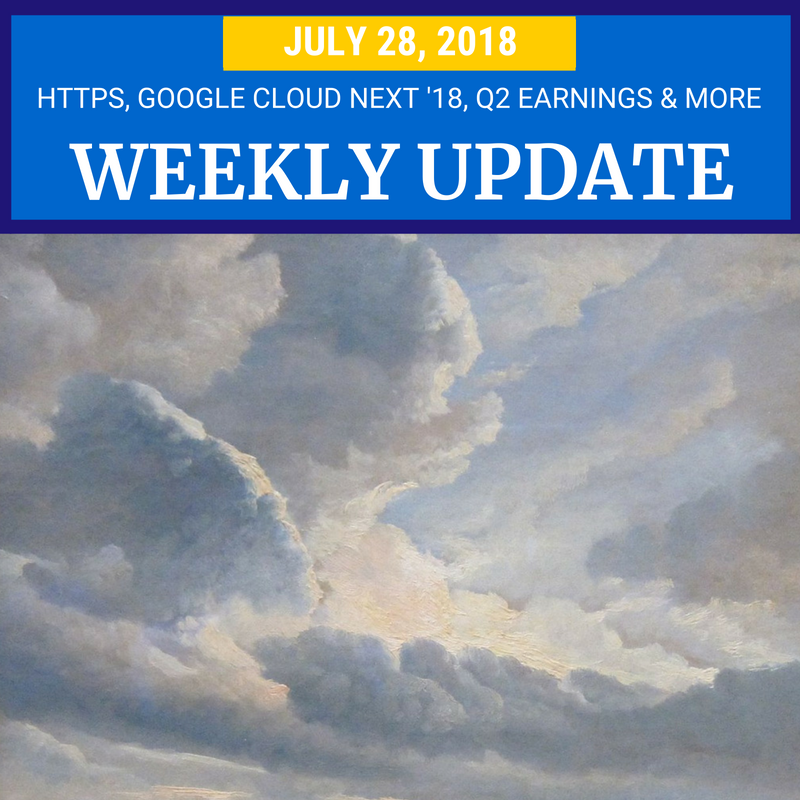 Plus Chrome started marking “Not Secure” sites, YouTube is testing a new “Explore” feature and tech companies released their second quarter earnings reports (good for Alphabet, not good for Facebook & Twitter). This week was Google Cloud Next ‘18 (https://cloudnext.withgoogle.com/), the annual Google conference focused on Google Cloud and G Suite offerings for enterprise customers. Announcements (coming soon!) include AI-powered features like smart reply in Hangouts Chat, smart compose in Gmail, grammar suggestions in Google Docs, and voice commands in Hangouts Meet hardware. Google is also bringing an enterprise version of Google Voice to G Suite, with its own AI features to “facilitate voicemail transcription and spam filtering”. See the links below for details about all the announcements for G Suite, Google Cloud Platform and more. Chrome 68 was released this week with a major change: now websites that are not encrypted with HTTPS as marked “Not Secure”. If you have a website (even a static one) or blog, now is the time to enable HTTPS on your site. Blogger blog owners with custom domains can enable HTTPS in settings, and blogspot.com domains use HTTPS by default. YouTube is testing a new Explore tab to help you discover videos, channels and topics you might not otherwise see. If you use the iOS YouTube app, and are in the test group be sure to send YouTube feedback. Both Twitter and Facebook saw their stock take a huge dive this week. What caused such investor jitters? Twitter reported that the number of active monthly users fell from 336 million to 335 million following recent clean-ups of bots, fake and offensive accounts. While “1 million users” sounds like a lot, it only represents a 0.2% drop. Facebook’s growth has also slowed, with “only” 22 million new daily active users worldwide, and no increase in the US and Canada. In Facebook’s case, 2.5 Billion individual users use at least one of its apps - Facebook, Instagram, WhatsApp or Messenger - which makes it likely they are running low on potential new users. Meanwhile, Alphabet, Google’s parent company, reported a jump in revenue for the second quarter of the year, despite the record $2.7 Billion fine imposed by the European Union. YouTube is “growing tremendously”, and Loon and Wing have graduated to independent companies under Alphabet. Fortunately for Alphabet, the number of active Google+ users doesn’t determine how well the stock is doing. Read on for more tips and updates for Plussers, YouTubers, webmasters, and more. Enable HTTPS for your website or blog! Starting today Chrome will label sites using HTTP as "Not secure"